I've posted before about the wonderful rich and bold colors of Design Inspiration: Kate Spade. And now you can catch a glimpse at things that inspire her! I love the look of the site itself. Simply click on any of the small pictures and you'll be taken to it's story. Love this behind-the-scenes peek into Kate's world. And while you are there, gather some inspiration for yourself! 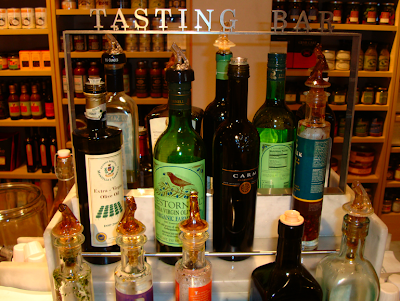 I love the olive oil tasting bar at William Sonoma. 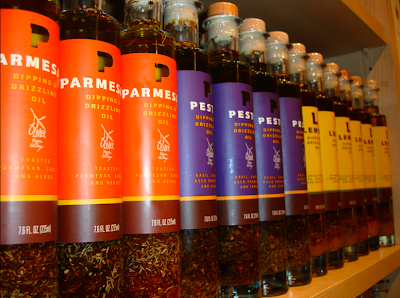 They carry over 40 types of olive oil (who knew?) and offer a free taste of each and every one. 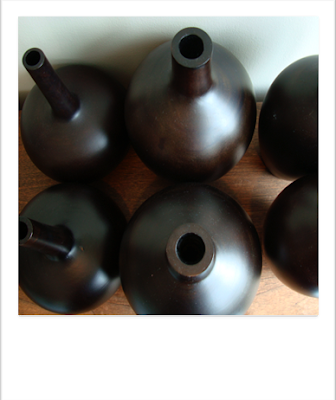 Small space accents, like olive oil bottles, can be arranged in your small kitchen to look like a collection or display. 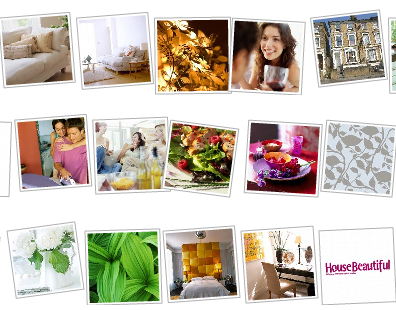 When designing the layout of your home, you want to be able to have easy access to your day to day things. 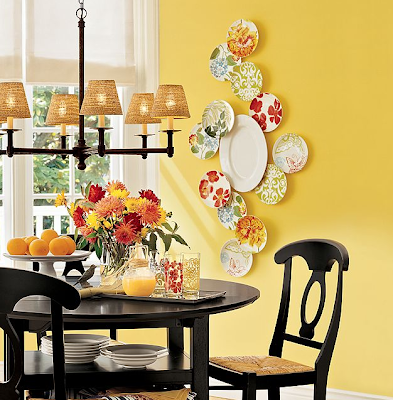 If it's a musical instrument, why not highlight it in your home's decor? 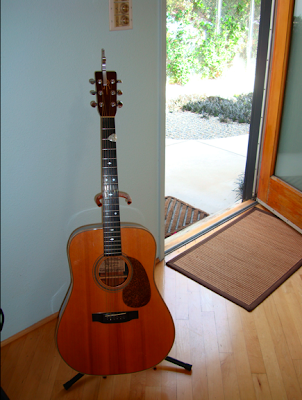 Then when you want to play a few tunes, you can. Plus, this is a nice conversation starter for guests and friend. One trick for creating cohesiveness and harmony is by using symmetry in a small space. I particularly like using matching chairs on either sides of a table. If this is in a small entryway, try using the dual chairs almost as a table, to stack books or objects. If this is used in your living space, the dual chairs should be function seating in your space. 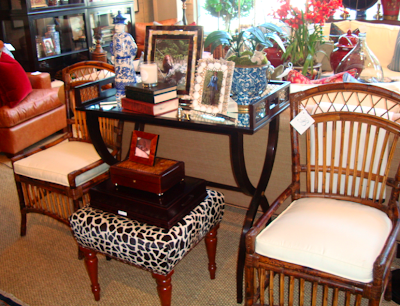 And, of course, layering any furniture is both stylish but a resourceful way to maximize space. I love how the giraffe print ottoman can slide out for additional seating. Ohhhh - love these! 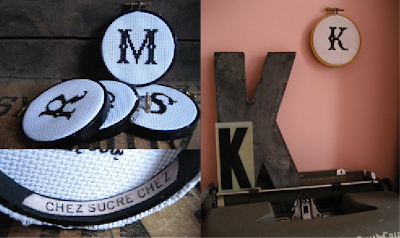 I spotted these sweet monogrammed embroidered palettes on Design*. Designer ChezSucreChez can custom make your own initials. 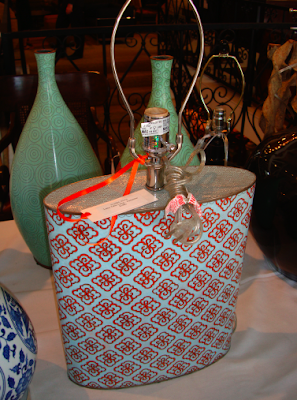 The simple stitching and color combinations can be a wonderful small accent in any part of your space. I just returned from a fun trip to Washington, DC. I love this time of year on the east coast, with the leaves turning colors, fireplace burning smells and colorful tones and textures. 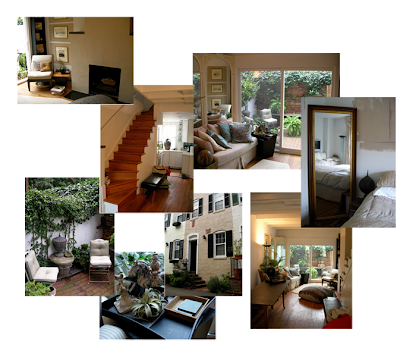 I found this Georgetown rowhouse a few months ago (yikes can't find my credit! for the gorgeous house) and wanted to share it with you. 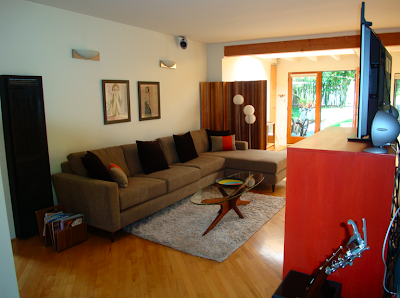 It epitomizes small space living at it's finest! 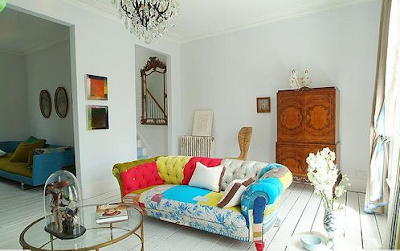 Wonderful style, great use of space, full of function and endlessly comfortable. I have posted about how using plates is a great and affordable way to extend the look of your space - both visually and artistically. 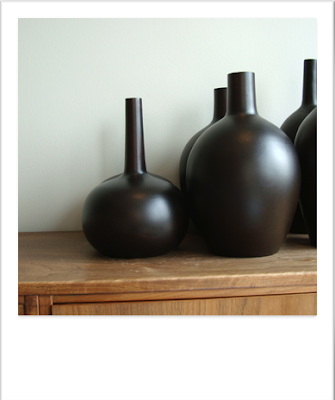 I just spotted this overlapping plate idea on Pottery Barn's website. 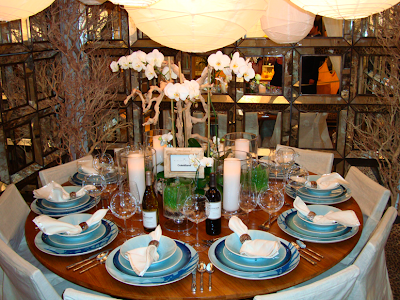 I love how by simply layering a bit of each plate creates dimension and interest. 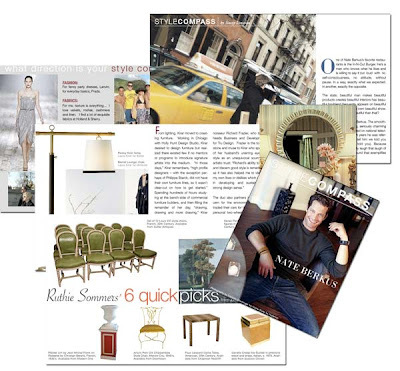 Style Compass, the virtual magazine counterpart to 1st Dibs, is a roster of trendsetting designers. Each 9-page issue spotlights a designer who refines style + inspiration + form + function + innovation. And it's there for you to read and gather inspiration for free! We love the editorial format too, which offers insight into each designers' life, where they are heading and their six quick picks. 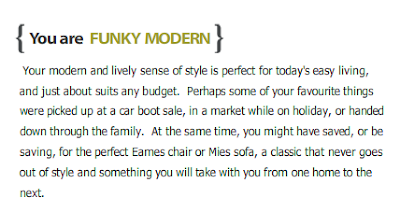 And while we do love lounging on a couch and flipping through a stack of magazines, this online style guide is worth the computer read. Click here to check out Style Compass and 1st Dibs, a premiere treasure chest of coveted furniture and decor that could be yours if you get there first. If you are lucky enough to have a fireplace in your small space, why not try this personal yet artistic art gallery idea of hanging individual pictures over the mantle to create a large focal point? 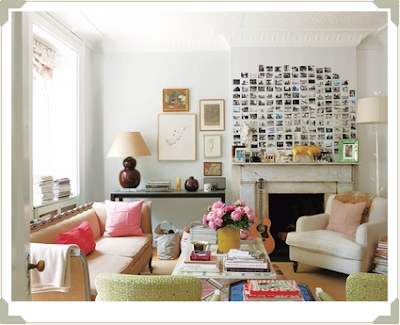 We love Rita's Bank Street apartment featured in the current issue of domino. This wall of polaroids tops if off - classy yet whimsical. Love it! 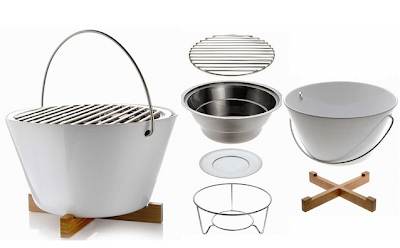 I adore Eva Solo's beautifully designed products and this compact table grill is no exception! The clean lines and simple look of the grill is perfect for small space grilling. I love the little wood stand too. 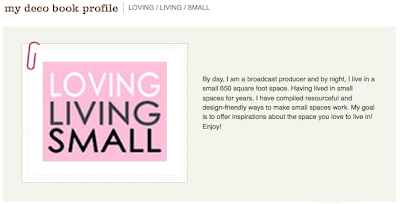 Check out the new look of LOVING / LIVING / SMALL! Maybe it's the change of the season but I wanted something white and light. Hope you enjoy the new look with white background and new heading. When living in a small space and accommodating the compact layout, creating and recreating your design style seems to be more common then not. Over at AT this morning, I posed the question "How often do you change your design style?" 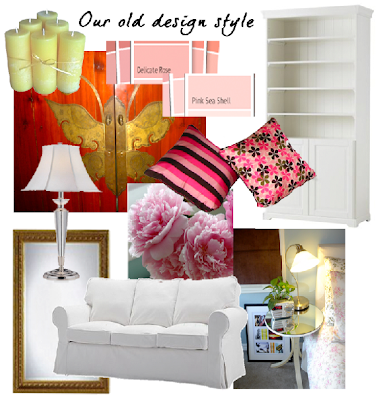 While our current style is still evolving, we are enjoying the transition from shabby chic to modern mix. To read the full post, click here. I enjoyed a day of window shopping at the gorgeous showroom of Barclay Butera and spotted this simply stunning lamp base. I couldn't get over the sky blue mixed with the deep blood orange color combo! This lamp would look amazing on a side table like this. Picking unique and interesting color accents will make your small space shine. Love this idea! Phunklab will take your picture and any writing (letters, emails, lyrics, poems - you name it!) and create a custom made canvas. This is such an awesome way to capture someone or something special in your life. 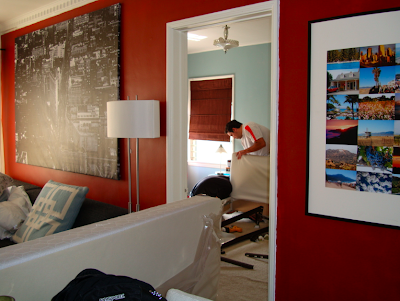 And, of course, any time you can use personal pictures in your home art gallery is special and rewarding. 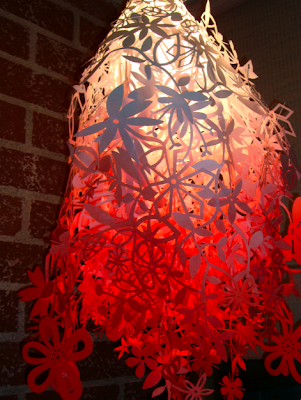 I absolutely love the Midsummer Light by Tord Boontje. Available in white or white with a splash of red at the bottom. You can enjoy it too via the MoMA Store. Inspired by domino and coco + kelley's love of turning outfits and movies into rooms, here's my own version - turning a city into a room. 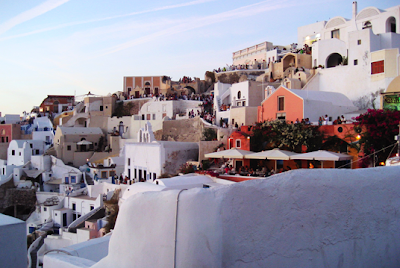 Here is a gorgeous shot from my close friend's recent holiday to Santorini and here's a pretty room featured in Living Etc. I love the white tones and pops of color in the hillside town and thought the casual elegance of the rooms layout matched it well. 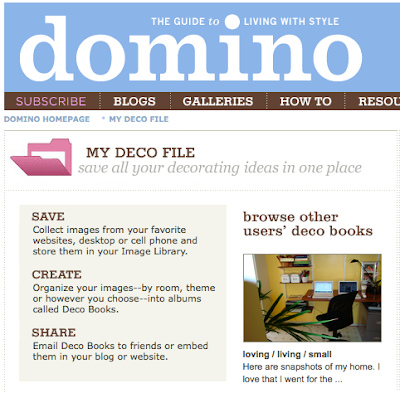 I received an email this morning that one of LOVING / LIVING / SMALL's Deco Books is featured on the home page over at domino! Check it out here! I went to a fun event last night at the L.A. 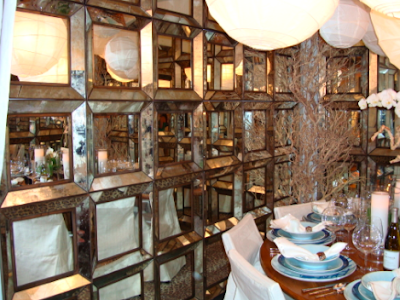 Mart Design Center - DIFFA's DINING BY DESIGN 2008. 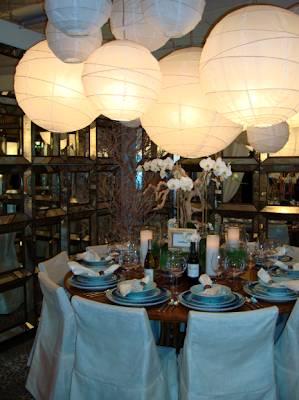 Designers were commissioned to create a tablescape and I saw everything from subtle and conservative to elaborate and avant garde. All of the tables were colorful and stunning. 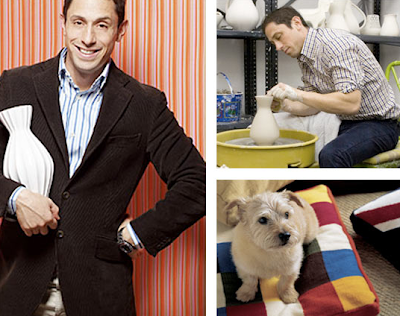 I'll be posting about the event this week on Apartment Therapy, but here's a sneak peek of my favorite - Barclay Butera. I love his use of mirrors as a wall treatment (small space design tip to expand a space) and his elegant grouping of paper shades. 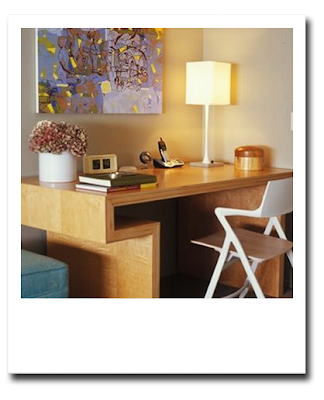 I have posted many times about the rewards of using your own personal art to create galleries in your small space. This is really a meaningful and creative way to showcase your work and allow for those fun memories to always be on your mind. Three years ago in Chicago, I snapped this pic of my boy and I in the reflection of Cloud Gate, a gorgeous sculpture in Millennium Park. (That's me in the red skirt). It's by far my favorite pic and it hangs in our main room. 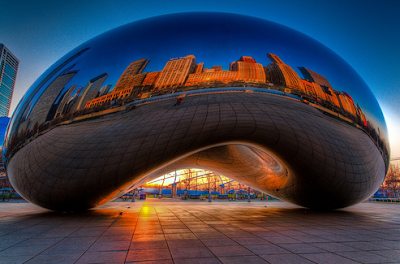 Just the other day, I came across quite an amazing shot on Flickr of the same sculpture by photographer iceman9294. 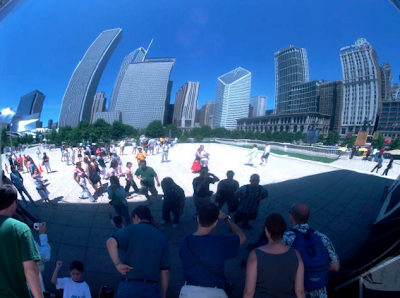 It quickly reminded me of my wonderful time in Chicago and my own picture hanging in my home. 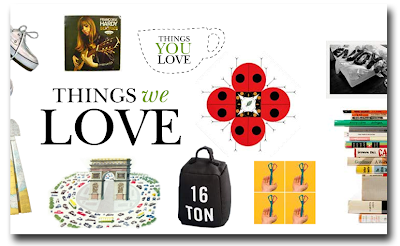 I enjoy getting Anthropologie's weekly emails in my Inbox. Always colorful and inspirational, this week's was simply fun! 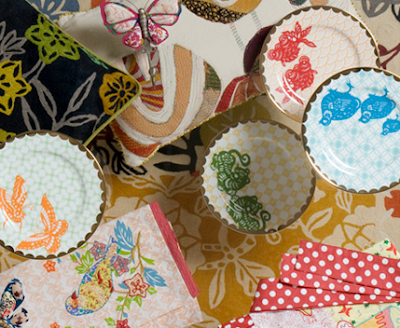 I love their term "collage kitsch" when describing the mixing of patterns and colors. And it really works! 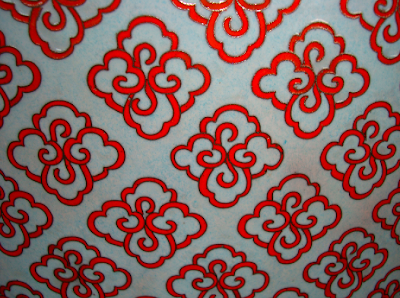 Quick tip - if you want to mix patterns in your small space, keep the color consistent. Then you will keep the cohesive flow of your space. I posted just this morning about one of my fave sites, Flickr, and how photosharing is an incredible resource for design + life inspiration. A new member of the photosharing world is domino. Their wonderful feature, MY DECO FILE, has many of the same concepts and ideas of Flickr and is connected right into domino's site. Not only can you add your own images and create your own Deco Books but you can add other members' imagery and photos right from domino. Inspiration all around!! Love that! 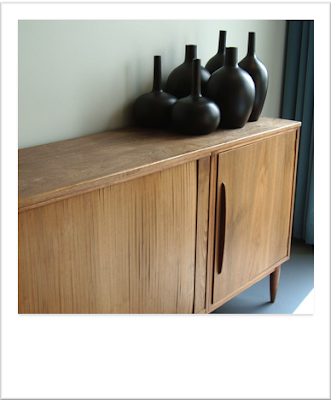 To sign up for MY DECO FILE, click here. As I mentioned last week, we finally got a brand new king sized bed for our not so big apartment. 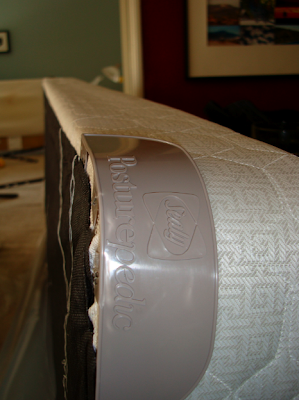 Here is us in "getting ready" mode by disassembling our old bed. If you are looking for ways to expand the look of your space, try integrating negative space to create a clutter-free environment in your home. You will feel less overwhelmed and the flow of your space will function better. One key to creating a negative space is to organize all of your essentials in a place where they can be hidden but accessible. Not only will this provide the clean surface you need but you will feel better about your organized space. Plus you have allowed your space to breathe and, therefore, seem larger. 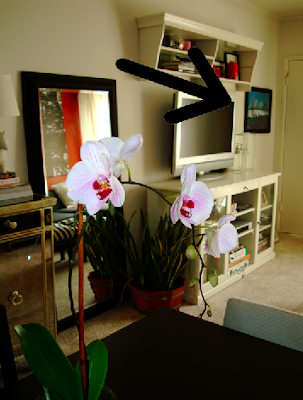 Try this idea in your own small space. For other pages out of the the SMALL SPACE DWELLER HANDBOOK, click here. 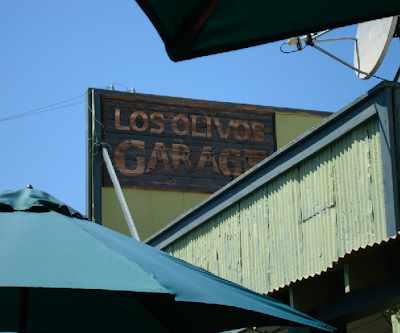 I posted about the leaning wine rack months ago and finally spotted one in Los Olivos, CA at the Los Olivos Garage, a little vintage shop in town. 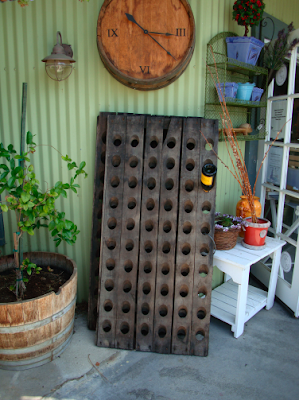 Although a bit pricey (about $295), it looked as rustic and cool as it does in the picture here. I often post imagery from one of my favorite sites, Desire To Inspire. 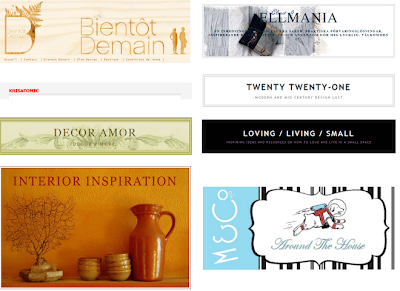 Their mission simple - showcasing beautiful rooms from all over the world. They recently updated the look of their site and with their easy tagging system, you can easily search by topics such as HALLWAY, ECO-DESIGN, WINKS and my favorite WHITE (see 10 of my favorite white rooms above). I was lucky to be featured in their READING GUIDE just a few weeks into starting loving. living. small. Check out my original banner and a few of the many wonderful sites featured in this section. 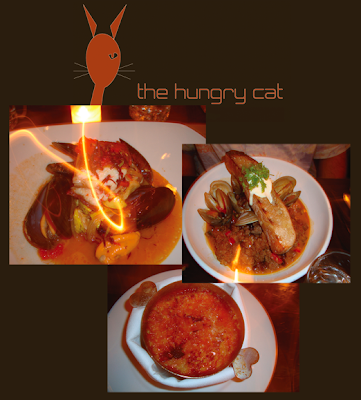 In Santa Barbara over the weekend, we enjoyed a a very delectable dinner at hip bistro, The Hungry Cat. 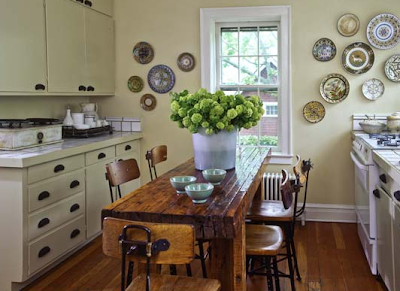 The small-ish and very comfortable dining space was simple in decor and the color palette rustic with clean lines. The food - amazing! Here are some pictures of our meal - Seabass for me, mussles for him and chocolate creme brulee for dessert. Yum! I love the colors of Bob Staake's poster collection featured here. 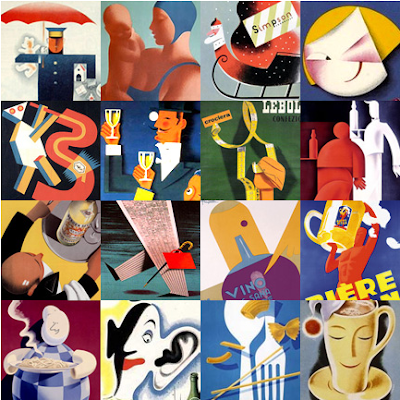 His collection of mid-20th century collection is rich in color and graphic design. 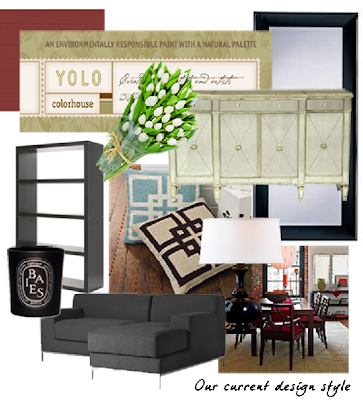 This could be a great way to find your next color scheme in your small space.